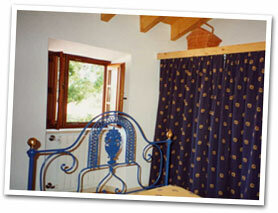 Pero Vicente' farm gives the name to a beautiful and small farm house built more than one hundred years ago. Placed in the Portuguese southwest cost, in a Natural Park, 200 kilometres away from Lisbon and 90 from Faro, the house was recently transformed to give our guests more than a picture of rural life. Close to the bluest sea of the South Atlantic, one can walk from the house to the nearest beaches, along pine wards and dunes, enjoying mixed sights, sounds and smells of the fields and the sea! The characteristic Sun of Algarve shines almost all the year and at Pero Vicente' farm is the guest who chooses where to spend the time during his holidays. From the sun and sand of the beach in the mornings, trough the fresh and quite rooms of the house at lunch time, to the shadow of trees and the smell of grass and earth in the afternoons! The sunset and nights, with the moon and starlight, are always exotic moments at the south west cost of Algarve and at Pero Vicente' farm, nothing disturbs the relation between our guests and the Nature. In the house there are only three sleeping rooms to rent, all of them provided with couple or double single beds, bathroom and with all their furniture made of oak wood. Generous windows give our guests different moments of the landscape, the sea, the pine wards or the hills. A dinning and a sitting room, as well as an atelier and a kitchen are the other parts of the house. The kitchen is restricted to the house service, however mums and babies can use it for their own. Our prices are different according to seasons, but include always, not only the room service, but also a special farm breakfast, provided with the famous Rogil' bread, fruits, juice and milk, butter and marmalade from Pero Vicente or other neighbour farms. The price does not include the main meals, however booking with the farm house main keeper, some typical dishes can be cooked. Picnic baskets are also possible of booking. Included in our prices, are the mountain bikes for the guest rides in the farm or around it. Free are also the net services we provide, as well as maps, books, binoculars or even the telescope for the night sky viewing!